Martin van der Westhuizen and Chanté Olivier were the overall winners of the Mountain Top Adventures Trailfest which was staged at Santa Fé, close to Maselspoort on the outskirts of Bloemfontein. 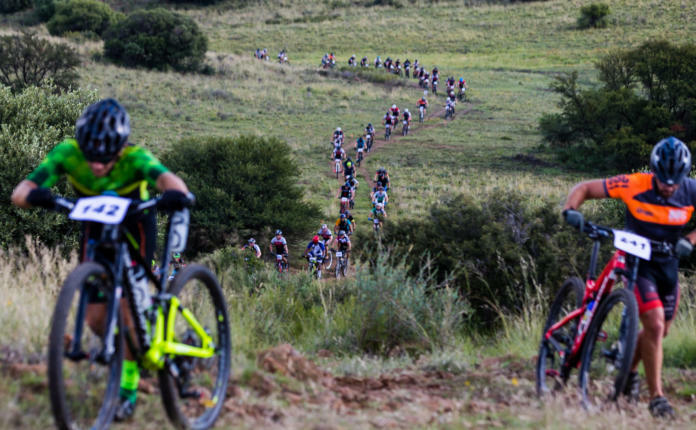 Van der Westhuizen claimed their honours in the men’s elite section, with Charl Coetzee and Werner van der Merwe completing the podium in the class. It came as no surprise that Jean Fourie won the men’s veterans ahead of Tertius van Niekerk and Craig Blake. Dirk Maarsingh won the men’s masters to ride across the line in fifth overall and claimed a comfortable win in his class with Hannes Groenewald riding in second and Etienne van Niekerk taking third for 24th overall. The teenage cycling star, fresh off her seven gold medals at the National Track Championships in the Cape, Chanté Olivier, was the first lady to cross the line in tenth overall to win the women’s juniors. Liza-Mari Gilliomee came in second overall among the ladies to take the honours in the women’s seniors. Elizma Kock took second in her class, with Marlize Roodt riding in third. The first junior across the finish line was Franjo Hattingh to take 9th overall, with Phillip Potgieter taking second, and Tian Correira completing the podium line-up.